Jeroen Dijsselbloem is currently President of the Eurogroup, having been reelected by the euro area finance ministers for a second term in July 2015. He is also currently Minister for Finance of the Netherlands. Since February 2013 he serves as Chair of the Board of Governors of the European Stability Mechanism. He has served in a number of government positions, including as advisor to the Dutch Minister for Agriculture, from 1996 to 1998. He also served as a policy officer for the Dutch Labour party. From 2000 to 2012 he was member of the House of Representatives of the Netherlands. 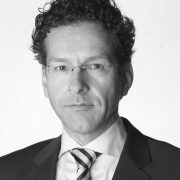 Jeroen Dijsselbloem studied business and agricultural economics at Wageningen University. He was born in Eindhoven on 29 March 1966 and now lives in Wageningen with his partner and 2 children. Jeroen Dijsselbloem, President f the Eurogroup, delivered the keynote speech at Bruegel's Annual Dinner 2016, held on 6 September 2016.